Crypto trading does not have to be as difficult as outsiders perceive it to be neither does it have to be extremely risky. Even though every kind of trading activities carries a certain degree of risk, a trader can minimize the risks if he/she sticks to trading right. Like typical forex or stock trading, it is important to try to understand the market before delving into it as well as selecting a technique that will be both suitable and profitable, cryptocurrency trading is no different. Cryptocurrency trading involves reading cryptocurrency market charts, understanding it, understanding the amount of time at your disposal and working with the different type of orders on cryptocurrency exchanges. While this may sound like a lot for beginners, it wasn’t that complicated once you understand the different aspects there are and put them into practice. Long-term cryptocurrency traders are in for the long run, these type of traders benefit from the increase in value of their cryptocurrency holdings in a more extended timeframe. Many but not all in this category of traders tend to be early investors who buy the coin when it is still cheap, hold it and ride the tide and then eventually sell. Short-term cryptocurrency traders keep their cryptocurrency holdings for a shorter period than the aforementioned. Short term trading has its benefits over long-term trading, because in the case of an extreme dip or market surge they do not lose as much as with long-term trading and by the same token when cryptocurrency experience large growth over time spent on the market, short-term traders do not benefit as much. The long and short-term cryptocurrency trading can be further subdivided into these five categories and they are grouped based on the time taken between buying and selling of crypto holdings. This type of cryptocurrency trading is the most basic of all of them, it is a type of long-term cryptocurrency trading and to some it is barely considered a type of trading. It involves less amount of work monitoring the cryptocurrency market. Holding involves buying cryptocurrency and leaving it to increase its value over time, even through a decline of value; To involve in a buy and hold cryptocurrency trading one needs to be able to control their anxiety and not sell as a result of panic in times of downward movement. 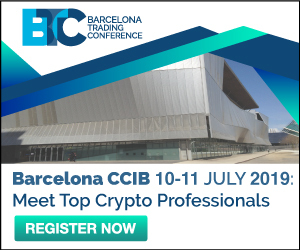 Traders in this category may find it helpful to secure their initial investment at the time when the value of their cryptocurrency holdings double in value or increase significantly so that while their initial capital is secure, the equivalent amount cryptocurrency purchased at the beginning is still in their holdings. Traders in this category have to be careful not to get too greedy and take out their capital when they should. The timeline for this style of trading is mostly unpredictable because investors take out profits from time to time to use in other non-virtual investments or expenses. Cryptocurrency traders that perform scalping are the most active cryptocurrency traders in the group because the type of trading demands a lot of time sent online, monitoring the market, an taking advantage of every slightest turn in the market. Scalping trading are also a form of day traders. Considering the prospective frequency of this type of trading, it is important for cryptocurrency traders to take into cognisance the trading/exchange fees on the platform because if the profit perceived is not substantially above the charges it might as well not be a good idea to trade at that time. Scalping trading is done in the shortest of time sally in seconds, the idea behind scalping to sell out in a very short time so as to lock in profits in market price before a dip occurs so as to avoid suffering the consequences of very serious price drops in the market. Although the profits in this type of trading is generally low, but might be a more secure type of short term trading compared to prospective losses of long-term trading. Day trading type of cryptocurrency trading is a type of trading done during the most hours of the day which is daytime at periods when the market is most active. This type of trading is a type of short term trading and generally is a good idea for traders that have decided to invest long hours in cryptocurrency trading, most likely it will be hard to stay dedicated to other commitments as a day trader. The difference between day trading and scalping is that day trading takes a longer time between buying and selling of cryptocurrencies. Since decisions in day trading are done between a time span of 30 minutes to a few hours, it is ideal for traders that are hands-on and always searching the markets, ones that are not as impulsive as those involved in scalping. Day trading is a good idea especially if the trader decides to fully make a living out of their crypto trades. Which means you are a full time trader, with minimal distractions because cryptocurrency prices fluctuate easily and values can go to favourable points at any time of the day and you have to apply a hands-on approach. To minimise risks on day trading it is better to trade with smaller amounts. In swing trading, a longer time is taken before decisions are made unlike in day trading but it still classifies as short term trading because decision is made in days while long-term trading could take as many as months to monitor. In swing trading, an opening is made and is left for a long period of time during which the trader watches the market and should be relaxed or patient enough not to panic at slight market fluctuations. Swing traders are more patient that day traders, they are more calculated and likely have taken time to understand market fluctuation of coins enough to know that even with drop in values there could be a profitable growth around the corner. Swing trading is the most popular type of trading involved in and is even more profitable when limit orders with a wide margin are used to control openings and lock in profits. 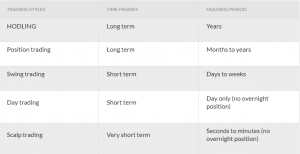 Position trading can be considered a long-term trade just like buy and hold. Position traders are traders that are willing to take their eyes off the market charts for a while and do other things, this type of traders do not depend on cryptocurrency trading as their daily means of livelihood. Position trading requires a certain amount of trust in cryptocurrency holdings, most likely attained after an in-depth study of the white paper and previous market history of the cryptocurrency of interest. Traders of this type are the ones who ask questions and access the coin’s future prospects in the market. While a critical look at coins of interest is important before deciding to invest in it, this category of traders is likely to do an even more thorough research. It is not ideal for people that plan to make a living out of crypto trading and is even considered more as an investment than a trade. Success in any type of trading has a lot to do with an understanding of one’s self and their level of experience and/or exposure to trading in the past and even when this quality has not been assessed, trading in small quantities can help in figuring it out. Previous Entry How to stay safe from cryptojacking?